A cooking challenge organized by Meg of Grow and Resist and Briggs of Oh Briggsy in which we explore a featured cookbook each month. This month’s selection is The Mile End Cookbook by Noah and Rae Bernamoff. It was about the pickles, or so he said. Handing me a Christmas present, he proclaimed that this book was “up my alley” since everything was made from scratch. He frequents the Mile End restaurant in Brooklyn, and I said that I would cook for him from the book if he would promise a trip. “To Montreal?” he asked, knowing that we’d been there many times, and that a childhood friend, now a writer, chronicles Jewish life in that community. No, I meant to New York, to the original restaurant in Boerum Hill, Brooklyn or to the new ‘branch’ in NoHo. I was hoping to take the field trip this month, but work and school and obligatory events have interfered, so all I have is the book. For now. I was pleased that Meg and Briggs chose this volume for our monthly cook-along, since I finally stopped procrastinating. Most of the dishes I wanted to try are real productions, taking place over days, and sometimes weeks. I followed three paths through the book: the pantry, invented traditions and nostalgia. 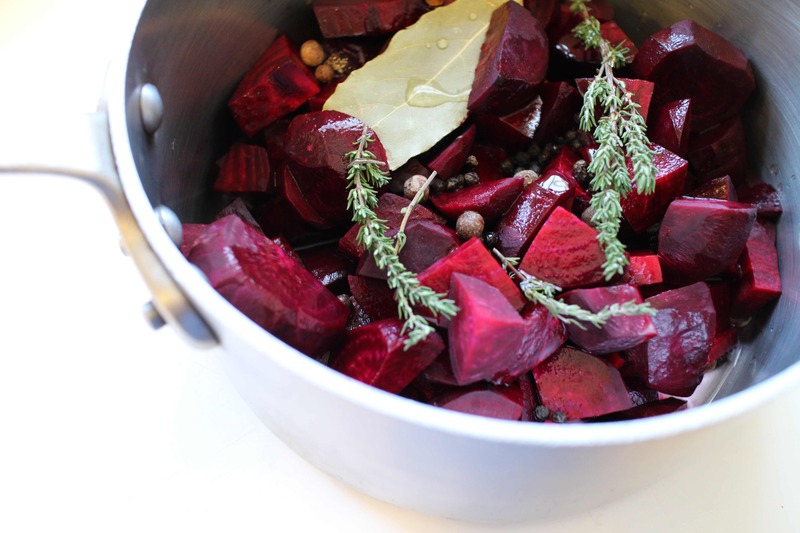 I made a batch of Vegetable Pickling Brine (page 64) in December and used it for Pickled Beets (page 72). Although I didn’t remark on the saltiness at the time, I later realized I should cut it in half. When the summer vegetables that the Bernamoffs pickled become available, I’ll try this section of the book again, but with reduced sodium. INVENTED TRADITIONS. I like the way the restaurant and cookbook invent new traditions. 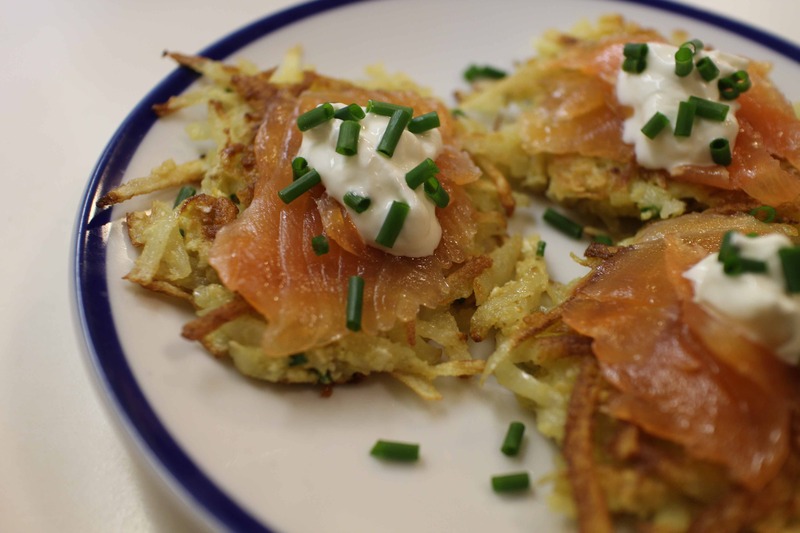 For example, in honor of their origins in Montreal, the Bernamoffs created a brunch dish they call the Mont Royal (page 101), which combines the simplicity of lox with potato latkes, regrettably often reserved for Hanukkah and now revived for everyday. The combination was superb, especially the contrast between the sleek fish and the crispy edges and creamy centers of the latkes topped with crème fraiche and chopped chives. 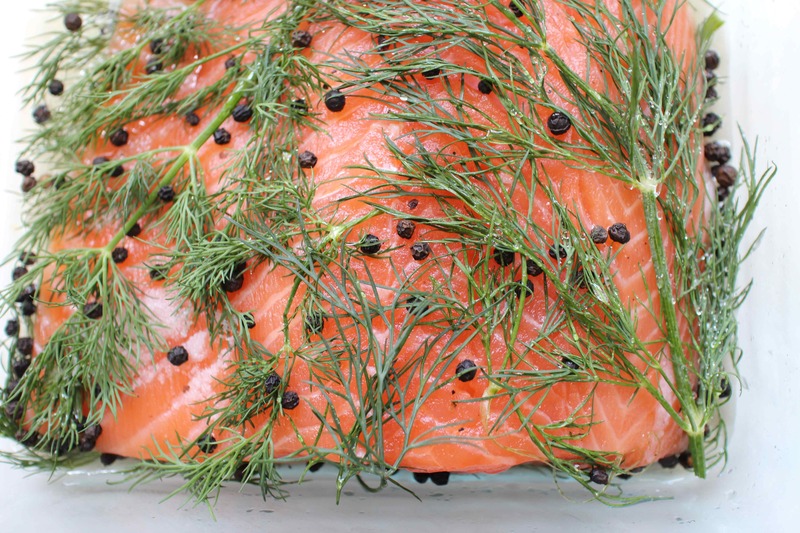 Over five days, I cured a fatty piece of sustainably farmed salmon in salt, sugar, peppercorns and dill. The fish mixture was drained and restarted every day until the last, when it air-dried in the refrigerator. The fat’s the key since it transports the salt mixture to the core of the fish, producing delectable Lox (page 56). I scrimped a little on the salt with no ill effect. The Potato Latkes (page 168), made much smaller than the generous Mont Royal, were just right, and better than the potato pancakes I’ve been making. Must be the matzo meal and the abundance of chopped chives in the batter. This is a keeper. NOSTALGIA. Among the premises of Mile End – the restaurant and the book – are to re-create for today traditional Jewish food of the past, to demystify made-from-scratch ingredients or dishes, and simply to produce at home the comfort food of a damn good deli. While the gift of the book was inspired by pickles, my own excitement focused on Beef on Weck (page 128). This sandwich epitomizes the comfort food of my youth in Western New York. It’s my Proustian madeleine, the trigger to memories of picnics and parties and family gatherings. 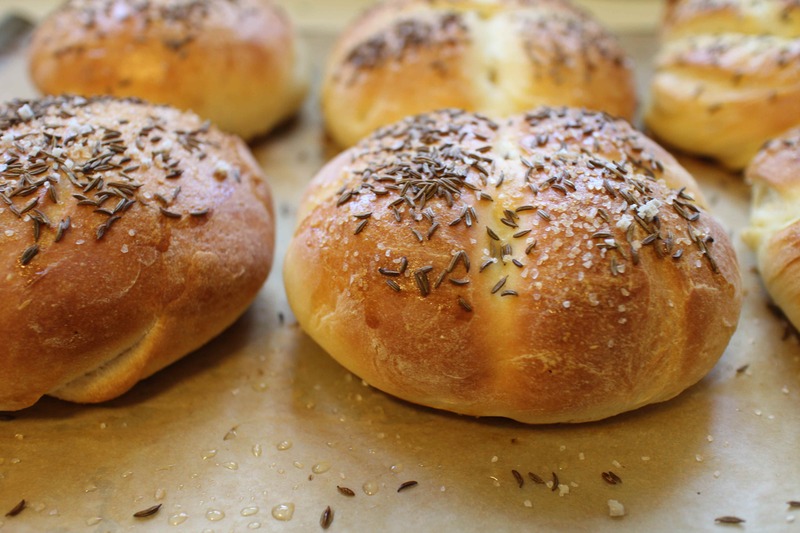 There’s something special about the way the Kummelweck Roll (pages 182-83), a kaiser roll showered with caraway (kummel) seeds and coarse salt, interacts with minimally flavored Roast Beef (page 41) and pungent Pickled Horseradish (pages 86-87). It’s the combination that works, since the crunchy-topped roll, lightly toasted, soaks up Beef Jus (pages 92-93) in the soft center. The combination of ingredients creates a memorable explosion of taste and texture. My family was in shock. How could something this simple taste so complex? As the person preparing it over a couple weeks’ time, I was thinking the opposite. How many steps and preps did it take me to get to simple sandwich bliss? A bunch. The beef stock that was turned into jus took one full day and an overnight, but produced the most delicious beef stock I’ve ever made. Since I make beef stock only once a year, the investment was worth it since I had several quarts to add to the freezer. New favorite. The rolls too needed a sleepover in the fridge and some patient periods to rise, but they were an awesome sight as they emerged from the oven. Mile End twists the dough into a pretzel-like Kaiser shape, but my memory recalls kummelweck rolls with quartered creases. I therefore made a couple where I sunk a dowel (handle of a wooden spoon) into the dough until it hit bottom, repeated it turned at 90 degrees, and scrunched the dough back together. Definitely, that’s the one. Like challah bread, Mile End’s version of the kaiser roll included egg, which gave the bread a good crumb, but I doubt that the weck rolls of my past had an egg in them. No matter. 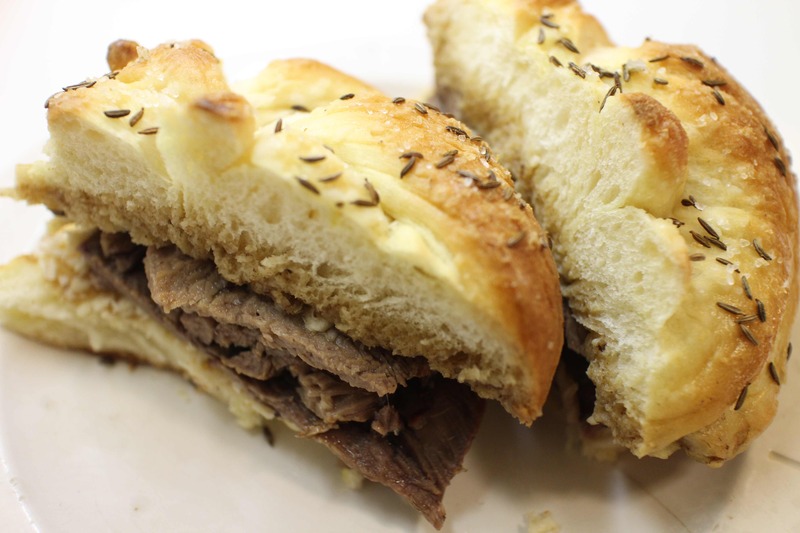 These were amazing.I just happened to be in Western New York last week on a business trip and saw beef on weck on a sandwich menu, served on some version of ciabatta that was sprinkled with caraway seeds and salt. I was tempted for one second to order it, but I resisted, knowing that I would be going home to make my own, more authentic version in the best deli tradition of Mile End. There will be more kitchen experiments forthcoming from this volume. Even so, I’m holding out for smoked meat when I finally get my trip to the restaurant …this spring?